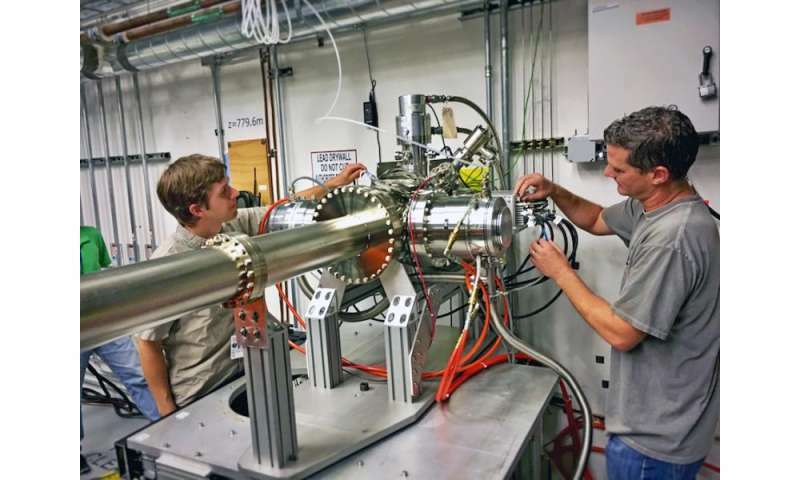 A new way of operating the powerful X-ray laser at the Department of Energy's SLAC National Accelerator Laboratory has enabled researchers to detect and measure fluctuations in magnetic structures being considered for new data storage and computing technologies. In a paper published earlier this month in Physical Review Letters, a team led by Joshua Turner, SLAC staff scientist, and Sujoy Roy, staff scientist at Lawrence Berkeley National Laboratory (Berkeley Lab), reported measuring the fluctuations in these structures, called magnetic skyrmions, with billionth-of-a-second resolution, 1,000 times better than had been possible before. 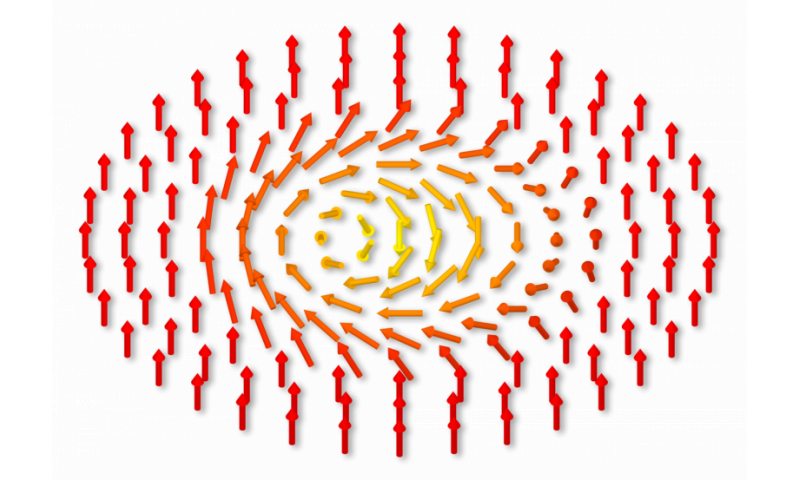 Skyrmions are multi-atom vortex spin textures in which the atoms' spin orientations change from one direction in the middle to the opposite direction at the circumference. They move easily in response to electric fields, which makes them attractive for use in data storage technologies, shift-register memories as well as advanced computing technologies. The charge and spin aspects of atoms are not rigid. They respond to a host of forces with vibrations and other movements – collectively called fluctuations – some of which even affect the motion of the atoms themselves. Theorists have proposed recently that fluctuations may have key roles in determining how complex materials behave, such as in the phenomenon of high-temperature superconductivity. Until now, however, there was no way to analyze skyrmion fluctuations in the thin-film structures needed for technological applications. This new result was made possible by a recently developed "two-bucket" mode for creating pairs of X-ray pulses at SLAC's Linac Coherent Light Source (LCLS) free-electron laser that allows researchers to study equilibrium phenomena that takes place in time periods less than a billionth of a second long for the first time. While individual LCLS pulses are usually separated by about 8 thousandths of a second, the two-bucket technique creates pulse pairs that can be as close as a third of a billionth of a second apart. When he learned of the two-bucket mode two years ago, Turner knew immediately that it should be useful for measuring fluctuations in magnetic systems, such as skyrmions. "Before this study, scientists have used LCLS to study non-equilibrium physics at even faster timescales," Turner explained. "The new technique opens the door to a whole category of experiments that can be now be done in equilibrium at a X-ray free electron lasers." By coincidence, Roy, a longtime friend of Turner's, had been using soft X-rays at Berkeley Lab's Advanced Light Source (ALS) to examine skyrmions and their fluctuations, most recently in an iron-gadolinium layered material grown by UC-San Diego professor Eric Fullerton. The two quickly agreed to use LCLS to see if they, in collaboration with Fullerton, could see rapid skyrmion fluctuations using the same sample. The detection process used to view the fluctuations is called X-ray Photon Correlation Spectroscopy. Shining an ultrashort pulse of coherent X-rays on the sample produces a speckle interference pattern that represents the sample's magnetic features. Following up quickly with a second pulse adds a second speckle pattern on top of the first on the same detector. Any fluctuations will cause the second pattern to be different, so the level of fuzziness in the combined image indicates the magnitude of the fluctuations in the sample. "This technique is similar to measuring the twinkling of stars to elucidate details of turbulence in the earth's atmosphere," Turner said. "In this case, the goal of measuring the 'twinkling' of the detected X-rays is understanding how the material's magnetic structure is fluctuating and how it impacts the material's properties." One of several challenges to making these measurements was reducing the intensity of LCLS's X-ray pulses so they would not create their own fluctuations in the sample. Various techniques ultimately reduced the flux of X-rays hitting the sample to a millionth of the original pulse energy. "We want to just tickle the sample," Turner said. "It's a far cry from the typical LCLS 'pump-probe' experiment, where the intense X-ray pulses can, by design, modify, or even blast the samples away." Developing ways to measure the X-ray intensities of each pair's pulses and their time intervals and to detect so few photons in the speckle patterns were also very difficult, added Matt Seaberg, SLAC associate staff scientist and first author of the paper. The researchers adjusted the time between each pair's pulses from a fraction of a nanosecond to 25 nanoseconds (a nanosecond is a billionth of a second) and also tuned an external magnetic field to span a range of magnetic conditions in the sample. "This is a completely new way of doing this kind of measurement," Roy said. "The time resolution is limited by the time separating the two pulses that the accelerator produces." When they tuned the external magnetic field to be most ideal for skyrmions in the sample, they saw that fluctuations occurred with a period of about 4 nanoseconds. But when the magnetic field was reduced slightly to where the circular skyrmion structures begin to give way to another phase with striped magnetic domain structures, the fluctuation period plummeted to only a fraction of a nanosecond. "This result indicates that the fluctuations are larger and more rapid near the boundary of the skyrmion and stripe phases," Joshua Turner said. "This information is important in deciphering the role that magnetic fluctuations play as the material transforms from one phase to the other. It also will allow us to connect to theoretical models used to understand how fluctuations promote phase transitions in a multitude of magnetic and magnetic-type solids." The collegial culture at SLAC played a big role in the success of this research, Turner added. The scientists worked closely with accelerator physicists Jim Turner and Franz-Josef Decker, who devised the two-bucket technique. "This all came about because of the close working relationship between the LCLS physicists on the X-ray side together with those on the accelerator physics side," he said. "Sometimes it's not clear how we can use their amazing developments. But working together made this a very fruitful endeavor." The same team is continuing to use the same techniques to examine Fullerton's material in more detail, and future work planned for this winter will explore other magnetically complex materials, such as spin ices and high-temperature superconductors.